Screenshots of woman sarpanch walking out of stage in Rajasthan, after MLA asks her to do so. Jodhpur, March 19: Lawmakers in Rajasthan have often been cited making controversial comments and doing weird stuff to retain their dominance in their constituencies. 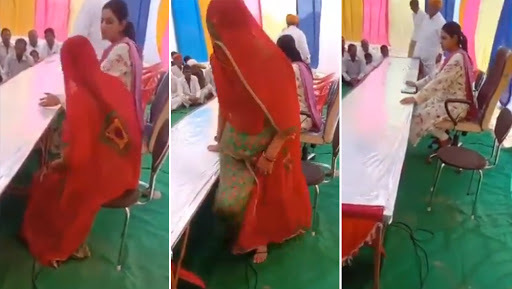 In the latest incident, whose video has gone viral, Congress MLA from Osian seat in Jodhpur – Divya Maderna – while during an interaction with Khetasar village asked a woman sarpanch to vacate the chair beside her and sit on the floor among the locals. According to the video, the incident took place on March 16, when Maderna arrived at the ‘Dhanyawaad Sabha’ in Osian. During the event, the woman sarpanch – Chandu Devi – goes on to greet the MLA and sat next to her. Maderna immediately gestures Chandu to sit on the floor with the locals. Soon, Devi left the chair and sat on the floor. On Fuel Price Hike, Rajasthan BJP Minister Rajkumar Rinwa's Shocker: 'Cut Down Consumption, Reduce Expenditure'. It is to be known that Maderna had earlier slammed a police officer in Jodhpur publically. She told him: “The government has changed, and the MLA has changed, working style hai na dhillam dhillu, woh badal dijiye (change your lethargic working style).” That video too went viral.